You may think potatoes come from Ireland or Idaho (unless you’re Dutch, in which case you have strong opinions about who the real potato-lovers are), but these tasty tubers actually come from South America! They made their way to Europe on the Spanish conquistador ship in the 1500’s, and didn’t hop the pond and onto U.S dinner tables until the late 1800’s. But now it’s 2016 and who doesn’t love potatoes? So for the next two weeks we’re chop/cook/chomping them up (and even making a potato dessert! ), but first, let’s learn! Sweet potato: Fooled ya! Sweet potatoes aren’t actually a member of the Irish potato clan. They’re more of swollen roots than potatoes, which is why they had their own spotlight ingredient week. 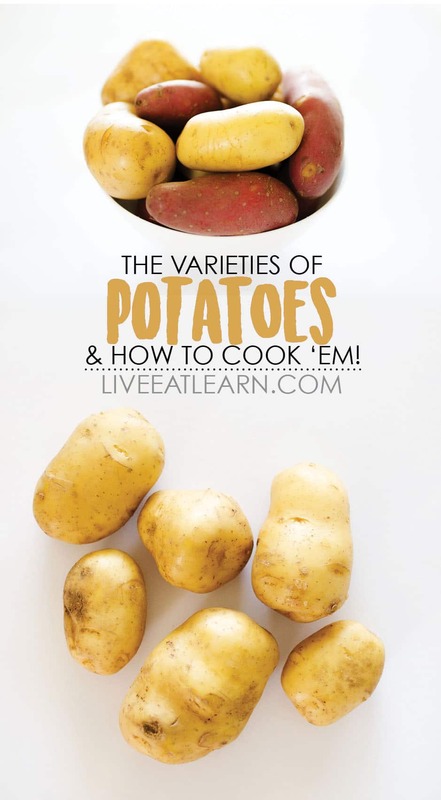 But we’ll include them in this list of varieties so you know where they fall on the starchy spectrum (which is generally how we classify potatoes). 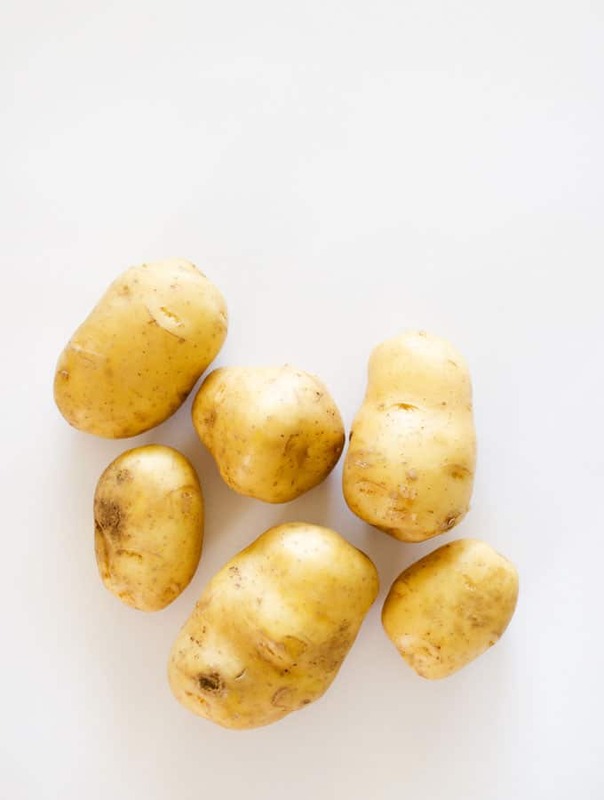 Starchy potatoes: These have more starches, which make them fluffy, absorbent (helllo butter), and great for baking or frying. They don’t hold their shape well and due to all the starches, can become a bit gluey when mashed. Varieties: Russet, Idaho, Katahdin (French fry potatoes) most sweet potatoes. 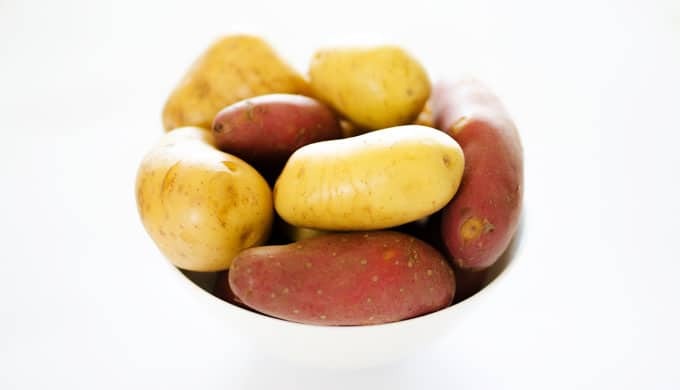 Waxy potatoes: These hold their shape well so they’re good for boiling and using in salads and soups. 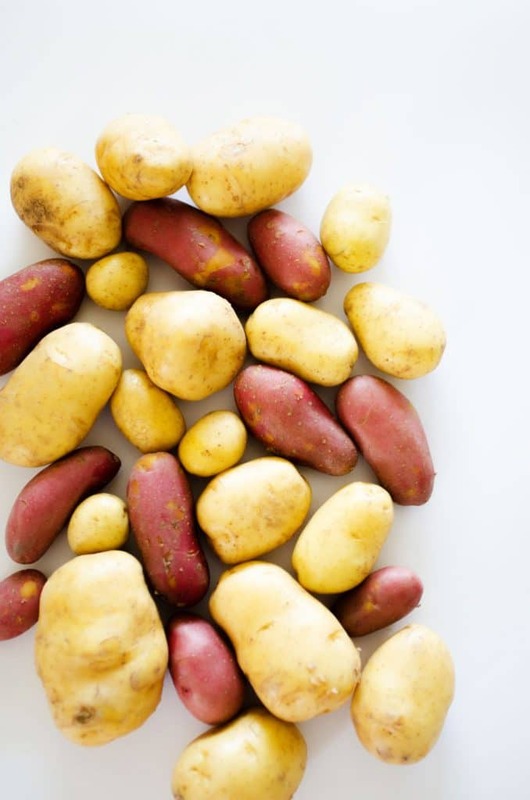 Varieties: Fingerling, Red Bliss. All-purpose: These fall somewhere in the middle of starchy and waxy, so you can use them for about anything! Varieties: Yukon Gold, many blue and purple potatoes. Potatoes can last a long time if you care for them right. 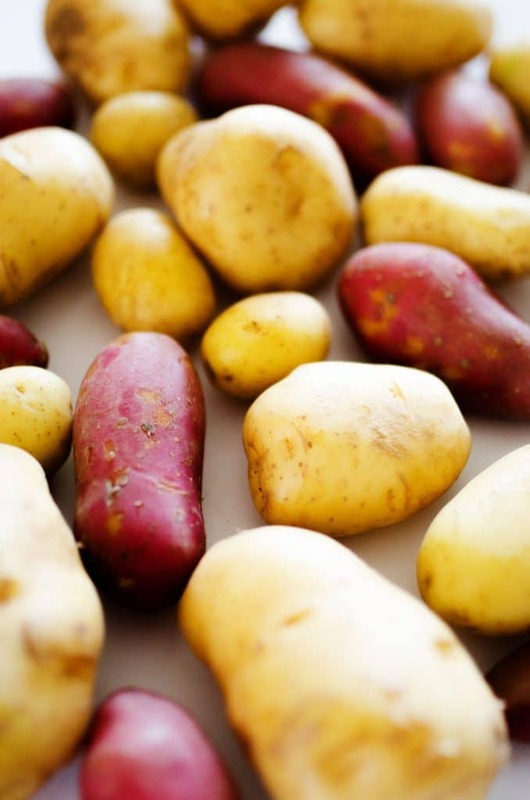 Store them in a cool (optimally 39 degrees F), dark, dry place, where they should last about 6 months. Don’t bother washing them until right before you’re ready to eat them, as this takes off the protective coating and can lead to extra moisture and mold. If you do the opposite of what I suggested in “how to store potatoes”, you can actually grow them! Warmth and moisture will cause potatoes to sprout, so just bury a few in soil and let them do their thing. My first stop when scheming up recipes is always my trusty Vegetarian Flavor Bible, where they list which ingredients go well with what. The following are a few ingredients that go really well with potatoes. You can use these as a starting point for your own cooking experimentation! 28% DV of Vitamin C: A water-soluble vitamin that acts as an antioxidant to fight against potentially damaging free radicals (molecules with unshared electrons that float around wreaking havoc) and an important cofactor in collagen synthesis. 12% DV of Folate (Vitamin B9): A water-soluble vitamin that helps make DNA & RNA and metabolize amino acids.